Collecting at the National Library goes back to the late 17th century; the official date usually given as 1689, when the Library of the Faculty of Advocates was founded; but collecting had already begun before then. Later referred to as the Advocates’ Library, this was a library for lawyers (‘Advocate’ being the Scottish term for ‘lawyer’). Although the library was a lawyers’ library, these gentlemen had wide interests and there was avid collecting of material from the UK and from abroad. In 1710, soon after the Union of the Scottish and English parliaments, the Copyright Act of Queen Anne gave the Library the right to claim a copy of every book published in Great Britain. It is currently one of the six legal deposit libraries in the UK, a privilege it has retained for about 300 years. After 1710 the collections grew at a much faster rate. The UK legal deposit intake was constantly supplemented by purchase and donation, so that by the 20th century this enormous library was effectively acting as the National Library for Scotland. In 1925 the Faculty of Advocates presented its library, with the exception of legal materials, to the Scottish nation, and the National Library was formally constituted by Act of Parliament, with an endowment of £100,000 from Sir Alexander Grant of Forres. By this time the collections were large and work began on the present National Library building after a further gift of £100,000 from Sir Alexander Grant, matched by government funding. This work was interrupted by World War II, so the present building in the centre of Edinburgh was designed and begun in the 1930s but not opened by Queen Elizabeth II until 1956. Continuing growth of the collections led to an application for funding to build another building, which was opened in two phases in 1989 and 1995 at a cost of £50,000,000. The library has always had a policy of collecting books and manuscripts about and from foreign countries in order to supplement its UK collections. Much has been collected over the years: the manuscript collections very much reflect the presence of Scots in India, while the printed collections bear testament to Scottish interest in the subcontinent. Rare Books in the National Library are defined as precious or more usually early printed material published before 1801. Our Special Collections contain rare material usually kept together because of date, subject or owner. The Advocates continued to collect material throughout the 18th century. There is evidence that they had a keen interest in South Asia from these early days of the library. The 1742 published catalogue contains titles of books on the Dutch East India Company, a number of them purchased, even from a very early date, an example being the account of Dutch explorations in the region published in Amsterdam in 1598: Premier livre de l’Histoire de la navigation aux Indes Orientales, by Willem Lodewijcksz.. Exploration remained an interest. 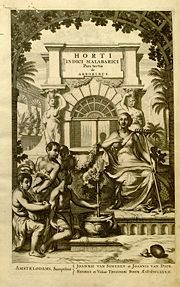 The Advocates also collected other important works on the subcontinent from an early date, and we have Draakestein’s early botanical work on Malabar, Hortus Indicus malabaricus (published in 12 volumes in Amsterdam from 1678 to 1703) for example. The 1776 catalogue of the Advocates’ Library contains a substantial number of entries for India, mostly concerned with the East India Company. There was much financial interest in the East India Company in Edinburgh, and the collections contain a number of volumes of lists of Edinburgh subscribers. The catalogue also lists works on Hindoostan and other works reflecting the British presence in India, many most likely received through legal deposit. The 1807 catalogue reflects the growth of the British presence in India and it contains three times as many works, especially historical and geographical. By 1876 – the date of the last independent published catalogue of the Advocates’ Library – there are six pages of entries on India, again with much also on the East India Company. Here we now have works on the Christian church in India and on the Civil Service. There are therefore a number of early printed English-language works from India in the collections, received through legal deposit or by purchase and donation. Interest in India from the early days is reflected in the fact that there are in the National Library of Scotland’s collections 23 works printed in Kolkata in the 18th century, including the Transactions of the Asiatick Society of Bengal. The collections reflect the British presence in India, and on the whole the Scots were well represented, especially in administration, mission work, and as soldiers. As might be expected, there is much in the collections on the legal system in India. Collecting of South Asian material, therefore, through legal deposit, purchase and donation, and especially works about South Asia, has continued into the 21st century. The rare books collections reflect the presence of Scots in India: many Scots formed part of the administration of the Empire and spent time in South Asia. Much therefore relates to colonial administration, but there is also – especially from the earlier period of contact (which has been referred to as ‘the age of curiosity’) – evidence of genuine curiosity about Indian culture and some intellectual exchange. Many Scots were linguists and worked on bible translation. Some had a genuine interest in the languages of India, producing dictionaries and grammars, often of course in a missionary context. John Borthwick Gilchrist is well represented in the Library’s collections of older printed material. He produced a number of works on Urdu, and his Dictionary, English and Hindoostanee was published in Kolkata in 1787-90. He is the first of the ‘curiosities’, as one of the many Scots who came to India in one profession but managed to spend their time studying the subcontinent. Although he came to India as a surgeon in the navy, he managed to devote eleven years of his life to the study of what he called Hindustani, though the value of his work to scholars of the language is now questionable. He was the first professor of Urdu at Fort William College which had been set up to educate the Company’s employees, and he produced one of the earliest Urdu-English phrasebooks, The Stranger’s East Indian Guide, published in Kolkata in 1802. A curious footnote in this phrasebook makes the point that since the British in India would be doing little more than telling people what to do, then the imperative case was the most necessary one to know, and indeed most of the phrases are commands. Kolkata was and still is an important publishing centre, and most of Gilchrist’s works were printed there. A number of early Sanskrit scholars were Scots, and the Advocates’ interest in this kind of scholarship is shown in their acquisition of one of the first Western books published on Sanskrit by Fra Paolino da San Bartolomeo, a Carmelite missionary in Malabar, which had been published in Latin in Rome in 1790. 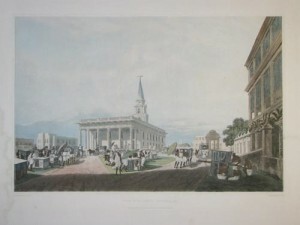 St John's Cathedral: from Fraser's Views of Life in Calcutta. Other Scots made contributions to the description of the subcontinent, for example James Baillie Fraser, who produced a number of aquatint views in the early 19th century, and was described by a contemporary as ‘half asiatic in his habits’ (whether a compliment or a criticism, this is at least a testament to his enthusiasm). He represents another Kolkata ‘curiosity’, having come to India, as many did, to make money for himself, he became intoxicated by his artistic response, and although connected to the firm Fraser and Mackintosh in Kolkata he seems to have quickly set off wandering and sketching in the Himalaya Mountains. He was the first to publish views of the Himalaya Mountains and he was a serious collector of works by Indian artists too. In 1824-26 Fraser published his Views of India: Calcutta and its Environs, containing 24 aquatints, including Botanic House and Reach and the Scotch Church. Rare Books and Special Collections also include photographs and photograph albums, and we have four albums of photographs assembled by or for James Bruce, 8th Earl of Elgin and Viceroy of India 1861-63, and his son Victor, 9th Earl and also Viceroy. One of these contains numerous photographs by Bourne & Shepherd. One other of these Kolkata curiosities, however, shows off the notorious side of the 8th Earl, who was noted for his ‘barbaric’ displays of wealth. In contrast to the albums of photographic views, this rich leather-bound album with gold trim consists purely of albumen prints by Schwartzschild and Conway Hart of Kolkata documenting a glamorous fancy dress ball held in Kolkata in 1863. In terms of special collections relating to South Asia, the National Library of Scotland is very strong on mountaineering and polar exploration. This means that, because of the Graham Brown Collection (a collection funded by a personal endowment, specifically for the purchase of items related to mountaineering), the coverage of the Himalaya Mountains (through older and more contemporary illustrated volumes, photographs and other purchases) is one of the most extensive in the world. Now turning to the material that has come regularly through the right to claim all UK publications – these legal deposit materials can also be extremely valuable and interesting. Many books from the US as well as the UK are acquired regularly this way, and South Asia is well covered as subject. Perhaps more interestingly, legal deposit has brought in pamphlets and periodicals of interest over the years, for example numerous UK pamphlets relating to the support in Britain for the Indian struggle for independence. Other examples of interesting material published in the UK are the many books of advice on how to survive in India. The volume Dogs for Hot Climates (2nd edition, London & Kolkata, 1908) gives, for example, advice on the breeds best suited to India as pets and hunting dogs. One famous example (in Scotland at least) is the Complete Indian Housekeeper and Cook by the Scottish writer Flora Annie Steel, along with Grace Gardiner. The 2nd edition was published in Edinburgh in 1890. It is mostly about how to treat servants and cook British food, and it offers much advice on clothing, advising women not to bring any decorative or heavily ornamented undergarments, as the dhobi was likely to scrub off the ornaments in the first wash. Flora Annie Steel made her name as a writer of novels set in India, where she spent many decades working for female education and collecting folk tales. Many items of interest have come to the library over the years. These can be single sheets, pamphlets or books, and they can be received by legal deposit (if British) or can be purchased or donated if foreign. Another example of an interesting curiosity reflecting Scotland-Kolkata links is an 1882 catalogue of the Kolkata-based Scottish pharmaceutical company Bathgate & Co., consisting largely of remedies for stomach complaints. Jute is another strong area of Scotland-Kolkata linkage, and we have a 1920 promotional booklet from the Alliance Jute Mills of Kolkata, which documents the plan of the mills as well as showing various buildings and workers arriving at a jetty on the Hooghly. The different practices of Freemasons following the Scottish rites are reflected in an 1868 publication of the Bye-laws of the Lodge St Andrew in the East, No.401, of Scotland, Constituted and Held at Calcutta in Bengal. Two items published in Kolkata in the late 19th century were probably received by donation from Scots returning to Scotland from India. These are firstly the Rules & Regulations of the Calcutta Football Club for 1874 (two years after the rugby football club was founded). In it you will find both rules of membership (by election only) and rules of fair play. In addition to this we have a report of the Calcutta Football Club for 1874, or rather: Analysis of Play During the Rains from June 20th to August 29th 1874. This records the matches and scores of that season. Intriguingly, though, the match reports make many references to ‘rouges’ as well as touch-downs and goals, for example: ‘1. June 20th-”Griffs” vs. “The Rest”, won by “The Rest” by 1 Goal, 1 Touch-Down, and 2 Rouges to 1 Touch-Down.’ ‘Rouges’ are not mentioned in the rules, nor known in the normal game of rugby – this is a genuine Kolkata curiosity. Nowadays, interesting South Asian material is supplemented by electronic databases and microfilm collections of older material, but we also have an interest in collecting current publications from South Asia, although the purchase of ‘foreign’ (meaning non-British) publications only really got going after the Second World War, when the main focus was Europe and the USA. Writer’s Workshop in 2001, by a truly Edinburgh-Kolkatan writer, and we have many more of these Writer’s Workshop publications at the National Library of Scotland, especially works by Asif Currimbhoy. One collection of note, and with very strong Kolkata connections, is known as the India Papers Collection, a collection of official documents published in India which is unique in Scotland, and is equalled in the UK only by a similar, but not identical, collection in the British Library. It includes publications of the central (Imperial) government and of many Indian states, most but not all of which came under British rule. The great majority of the collection dates from the mid 19th century up to Independence in 1947. Most of the collection was deposited in the Library under a scheme administered by the India Office, or published in the UK on behalf of Indian governments and acquired by the Library under the terms of the Copyright Act. It has been added to with other purchases and donations. The collection comprises over 4,000 volumes on a huge variety of subjects. It has particular strengths in the coverage of medicine, education, the military and archaeology, containing statistics, journals, memoirs, manuals, lists, maps, surveys connected to local and national administration and institutions and the government surveys (archaeology, geology, zoology etc.). Because Kolkata was the seat of government for most of that period, and the location of the government printing office, most of the titles are Kolkata publications. Examples range from country-wide coverage, for example Army Regulations. India, to state-wide (an example being the Annual Report of the Insane Asylums in Bengal, which contains, among other things, records of phases of the moon and weather conditions, in an attempt to measure their effects on the behaviour of inmates), and more local governmental records, as for example the Administration Report of the Calcutta Municipality, which gives detailed statistics and costs relating to sewage, police and gas-lighting etc. Because of the importance of the medical material in the India Papers Collection we have managed, as a result of a generous grant from the Wellcome Trust, to digitise this material and make it available online to a global audience. The website, called The Medical History of British India (www.nls.uk/indiapapers), contains a wide range of publications related to disease, public health and medical research, with regional histories as well as official reports. There are also maps, charts, tables and statistics, and subjects include army health, research institutes and diseases such as malaria, leprosy, cholera and plague. A map displayed in the Scottish Pavilion at the 2009 Kolkata Book Fair, published in Kolkata in 1896-97, shows Railway Plague Inspection Stations in India. This map also serves as a reminder of the size of our map collections, now about 2 million with their own map library, in which India is well represented. Survey of India maps, East India Company maps and charts, thematic maps, plans and charts are all held, and the Himalaya Mountains are very well represented in detail because of the Library’s concentration on mountaineering. Mainly unique handwritten documents, manuscript collections are often more valuable and intriguing. The Library’s collections have vast numbers of documents relating to India, reflecting mainly the presence of Scots there, and the collections are rich in material relating to the East India Company, the administration of British India, and legal, military, trade and missionary activities in South Asia. Various collections have come in over the years and some items seem to have been brought back by Scots returning from service in India, often as specially commissioned ‘souvenirs’. The focus of the collection is again the activities of Scots. They also include many official as well as personal documents, deriving mainly from the period when official documents were hand-written. Some of the collections relating to colonial administration are huge in size, for example the papers of Brigadier-General Sir Alexander Walker, who was in the service of the East India Company from 1780 to 1812. He was Political Resident at Baroda from 1802 to 1810. The collection of his papers and correspondence, known as the Walker of Bowland Papers, is substantial. It deals in detail with military and administrative activities in Malabar and Gujarat as well as containing his journals, notebooks, memoirs and other narratives, some of them, notably, about the war with Tipu Sultan. Walker had an eclectic interest in virtually all aspects of Indian life, wrote various histories himself, including a history of Gujarat, and many volumes of observations on local beliefs and customs, including volumes of sketchbooks of local cultural practices. Another substantial collection consists of the papers of Sir Gilbert Elliot, 4th Baronet, 1st Earl of Minto, who was Governor General of India from 1806 to 1813. This collection includes his family and general correspondence relating to government and administration, and much official material (e.g. 97 volumes of Secret Department Proceedings). In addition, the papers of Gilbert John Kynynmound Elliot, the 4th Earl of Minto, who was Viceroy of India, 1905-10, form a substantial collection that documents the administration of India from c.1883 to 1914. This vast collection contains official printed reports from all major government departments under both Lord Curzon’s and Lord Minto’s administration, as well as Lord Minto’s official and personal correspondence and papers, related newspaper cuttings, printed speeches and so on. These all cover the period when Kolkata was the administrative capital of India, and they are obviously important from the city’s point of view also. Another large collection, The Scottish Foreign Mission Records, contains much material related to missionary activity in South Asia from the early nineteenth century up to recent times and includes letter-books (books containing manuscript copies of correspondence dispatched) and other records of the Church of Scotland Foreign Mission Committee and of similar committees of other branches of the Presbyterian Church in Scotland. The collection is the biggest collection of documents concerning Scottish missionary activity of its kind. As well as letter-books and printed minutes there are vast numbers of photographs of missionary activity, missionary buildings, including colleges and hospitals and so on, many in India. This collection contains the letter from the East India Company to Dr John Inglis, Convenor of the Church of Scotland’s Foreign Mission Committee, granting Alexander Duff permission to travel to Kolkata as the first missionary of the Church of Scotland. Alexander Duff sailed in 1829 and endured two shipwrecks on the passage to Bengal. Duff was passionate about conversion through English-language education. In Kolkata he established a teaching institution, now the Scottish Church College, and he helped establish the University of Kolkata. Duff targeted the educated. The collection also contains a letter Duff wrote to John Inglis in November 1830, praising Ram Mohun Roy, who had helped him establish the school in Kolkata. It is believed this is the letter personally carried by Ram Mohun Roy when he came to Britain. Beyond these major collections of material there are also many, many individual collections of correspondence and related material that report on the experiences of individual Scots in particular, in government, in trade, in the army, in medical practice or otherwise. Much of the large missionary collection is complemented by individual collections of letters. There are also papers of Scottish travellers and explorers in the subcontinent. In some ways it is these collections of personal documents and correspondence that are most interesting. The collections contain numerous individual diaries and journals, as, for example the diary of Alexander Kyd Lindesay (1801-78), who was a surgeon in the Bengal medical Service 1821-29 (and seems to have spent a lot of time in the Bay of Bengal waiting for sufficient wind to sail). Much of our correspondence relates to Scots in the military. Sometimes this occupation ran in families and we have some generations’ worth of correspondence of for example the Brown family. Three brothers, nephews of the army officer Sir George Brown were in India. In the last letter that he wrote to his father in 1847, George Brown describes how he has again become ill with a ‘nasty cough’ and must appear before the Medical Board in Kolkata to get sick leave, which he is reluctant to do, having just joined the 10th Bengal Irregular Cavalry. He notes that his troops are not involved in any fighting, but his death on board ship in the Bay of Bengal a couple of months later shows how illness was a constant danger to soldiers. While on the one hand Scots seem to have got a reputation for being fiercesome in action as soldiers, more were killed by disease than warfare. We have correspondence collections from all types of Scots in India: some were rogues and wanderers, attracted by the desire to make money; many travellers wrote of their travels. The Archive of the publisher John Murray, who published a number of guidebooks, is held in the National Library of Scotland and contains a wealth of correspondence from Scots travellers in India. Others were more sober administrators, soldiers, missionaries, and most of all civil servants. It is thought that Scots were over-represented in the civil service in Kolkata and throughout the subcontinent. He goes on to recommend the Revenue Service in Kolkata, asks his son to write frequently and beware of overexposure to the sun, and finally to stick to ‘the true principle of honour’. Some of the most fascinating and the most colourful items from South Asia are the indigenous items that have found their way into the Library’s collections. Although we don’t currently have an active collecting policy for this kind of material, the collections contain many South Asian manuscripts (including some on palm leaf) in various South Asian languages, especially sacred texts, poetry and histories. The vast majority of these items came to the Advocates’ Library at a comparatively early date, mostly in the 18th or early 19th century. Very little is now known about how they were acquired or by whom. A lot of the material was presented to the Advocates’ Library by Scots returning from service in India, many of them probably commissioned as souvenirs. A number of our Sanskrit manuscripts, for example, were written on European paper (and later misbound in the Library so that every other page is now upside-down). These contrast with other items, for example a Bhagavad Gita in an Indian binding, which has a note attached to it from Robert Boog Watson, Chaplain to the Highland Brigade, stating that the manuscript was ‘taken at Kuraee, Oct. 25, 1858, by the Malwa Field Force… and given me by Lieut. Shewell.’ It was presented to the Library by a descendant of Watson in 1941. One particularly intriguing ‘curiosity’ from the National Library of Scotland’s collections is a personal horoscope in scroll form (a very long scroll). All that we know, from an accompanying note, is that it was produced for a ‘gentleman born in 1788′. It is in Sanskrit and quite heavily illustrated, and its illustrations in particular bear some similarities to Bengali decorated scrolls, a particular Bengali form, so I would like to think that our scroll is Bengali too. This talk highlights the historical links between Scotland and India – and between Edinburgh and Kolkata; a whole range of recent and ongoing projects and initiatives are strengthening these links into the 21st century.